Promise In My Pocket, God's Word on the Go is simply a way to keep God's life-changing promises with you as you go through your day. Each edition is a concentrated dose of God's Word on a specific theme to remind you of His goodness and faithfulness. 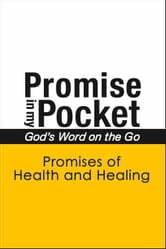 This edition, Promises of Health and Healing, holds over 40 verses that will confirm God's commitment to restore you, spirit, soul and body. In both old and new testament, God clearly demonstrated His wiliness to see His children healthy and whole. If you are enduring a crisis or know someone who is, whether it's financial, emotional or physical, God's Word very specifically declares His ability and desire to provide for and deliver His children. Spending time meditating on and praying verses that speak to your need will inspire you to trust Him during any difficulty you may face. Regardless of the situation or trouble confronting you, you will find direction and hope within the pages of God's Word. 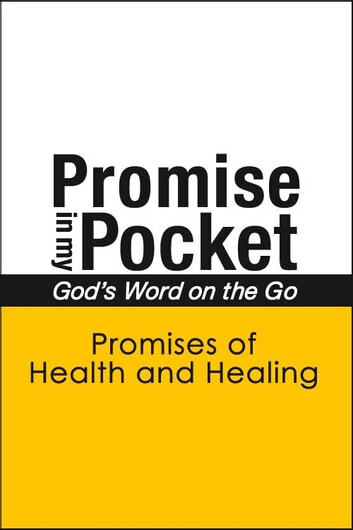 Using Promise in my Pocket as a resource for meditation and study will strengthen you as you lean into God to provide. In moments of fear and doubt, you honor God as you look past your problem and into His promise. Download copies onto your e-reader, tablet, smartphone and computer, or print them to reference during your day. Promises of Guidance and Direction — with more editions on the way. Ten percent of all proceeds are donated to help the less fortunate around the world through the extraordinary work of Hand of Hope, the missionary arm of Joyce Meyer Ministries.